There’s no denying it: honey is delicious. It’s sweet, syrupy and evokes a sense of indulgence and homeliness. In recent years, raw honey has received a big thumbs-up from the alternative health community as a “healthier” sweetener. The active enzymes contained within honey help our bodies more easily digest the sugars, and even help to lower cholesterol and aid in weight loss. But while you may be familiar with all this, you’ll probably be pleasantly surprised to learn that honey can work wonders for your hair, skin and nails. In the same way that honey nurtures your body and provides vital nutrients and antioxidants, it also nourishes your largest organ (your skin, in case you were wondering! ), revitalises your lovely locks, and adds lustre to your nails. And the best part? It’s completely natural. Why coat your body in noxious, chemical-laden creams and lotions when you can utilize something that is so good for your skin, you can eat it. How many lotions do you have that can boast that? Honey possesses the very convenient ability to hydrate your skin, promoting the restoration of skin cells and encouraging younger, more supple skin. This same ability means that honey can help to fade or potentially remove scars if applied repeatedly over time. Honey may even help to prevent scars from forming in the first place. Try rubbing the following concoction on small wounds or areas that have the potential to develop scar tissue. The anti-inflammatory and antibacterial agents in honey will also ensure that your booboo heals quickly and doesn’t develop an infection. What to do: Combine a teaspoon of raw honey with a teaspoon of either olive oil or coconut oil (I usually use coconut oil as it’s less likely to stain your clothes and makes you smell delicious). Once you’ve blended the ingredients (warming the coconut oil and honey to room temperature first should help with that), gently massage the salve into the area of concern for at least a minute. Placing a cloth soaked in warm water will help to soak the mixture into your skin, amplifying its healing properties. The enzymes in raw honey that make it such an easily digestible sugar also help to cleanse your skin and purify the pores of your skin. In addition, for those people who suffer from acne problems, the antibacterial powers of both raw honey and coconut oil can help to minimise bacterial buildup in your pores and prevent yet another zit invasion. What to do: Mix together room temperature raw honey and coconut oil until it’s smooth and malleable. Apply the mixture to dry, clean skin and gently rub it in, in a circular motion, making sure to steer well clear of your eyes. Leave the mixture on for a few minutes, then rinse off with lukewarm water. Honey can also be utilized to get tired hair back on track. Its healing properties, when combined with coconut oil, help to smooth hair cuticles, repair breaks and split ends, and restore that shine to your hair — which all the mainstream shampoo brands promise but never deliver. What to do: Mix together a tablespoon of room-temperature honey with two tablespoons of liquid coconut oil (coconut oil becomes liquid at around room temperature). Rub the mixture on your hands then apply it generously to your hair, starting from the bottom and working your way up towards the crown. Rinse off with warm water after leaving it in for around half an hour. This mixture utilizes the skin-healing properties of raw honey with the conditioning powers of coconut oil and the skin-softening ability of apple cider vinegar to wash away your cuticle woes. In addition, raw honey encourages the skin to draw moisture into itself, while apple cider vinegar helps to restore a healthy skin pH, which are all good things for your cuticles. What to do: Whip together a teaspoon of raw honey, a teaspoon of apple cider vinegar, and a teaspoon of coconut oil until thoroughly blended together. Rub the mixture over each of your cuticles, leave it on for 10 to 15 minutes, then rinse off. Remember, the key to success with honey is to only buy the good stuff. And that means investing in raw honey, preferably certified organic. Raw means honey that has been spared the injustice of pasteurization, which destroys honey’s active enzymes and denatures its complex assortment of antioxidants and nutrients through the process of heat treatment. 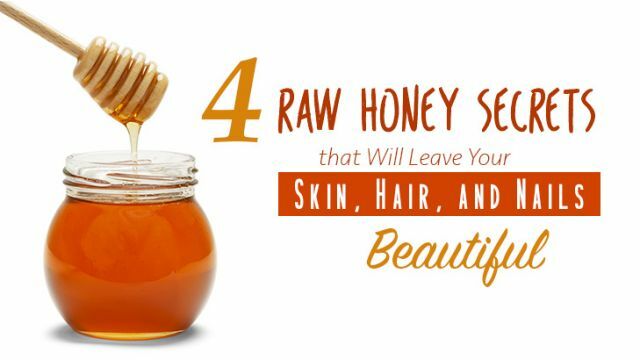 Hey Buddy!, I found this information for you: "4 Raw Honey Secrets That Will Leave Your Skin, Hair, And Nails Beautiful". Here is the website link: https://www.thealternativedaily.com/raw-honey-skin-hair-nails/. Thank you.